HOW TO REMOVE STAINS. They Should Always be Taken Out Before the Articles are Washed. 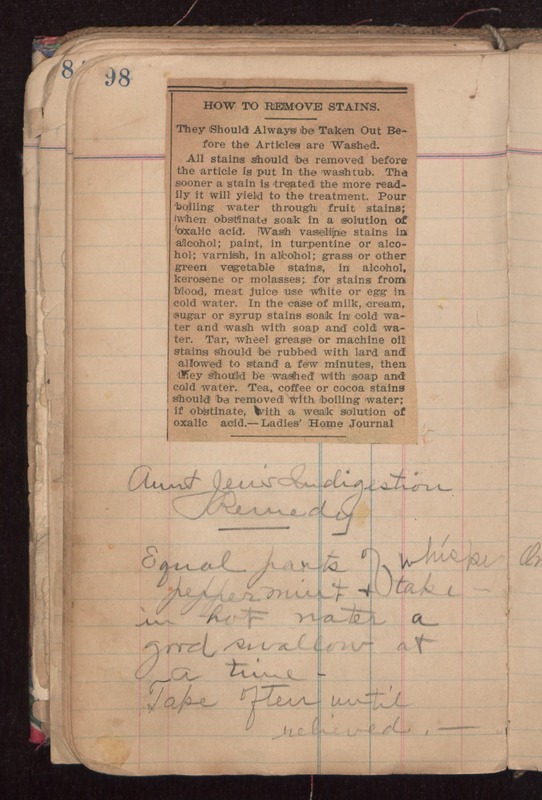 All stains should be removed before the article is put in the washtub. The sooner a stain is treated the more readily it will yield to the treatment. Pour boiling water through fruit stains; when obstinate soak in a solution of oxalic acid. Wash vaseline stains in alcohol; paint, in turpentine or alcohol; varnish, in alcohol; grass or other green vegetable stains, in alcohol, kerosene, or molasses; for stains from blood, meat juice use white or egg in cold water. In the case of milk, cream, sugar or syrup stains soak in cold water and wash with soap and cold water. Tar, wheel grease or machine oil stains should be rubbed with lard and allowed to stand a few minutes, then they should be washed with soap and cold water. Tea, coffee or cocoa stains should be removed with boiling water; if obstinate, with a weak solution of oxalic acid. -- Ladies' Home Journal Aunt Jen's Indigestion Remedy Equal parts of whisky peppermint & take in hot water a good swallow at a time. Take often until relieved.